Tibet remains one of the most interesting, remote and undeveloped parts of the world, situated at an average elevation of 5,000 (16,000ft) above sea level. Its limited facilities for tourists are only now approaching a reasonable standard. A trip to Tibet is not for the faint hearted, the traveling can be hard, adventurous and often unpredictable. Due to Tibet’s high altitude travelers with a history of heart, lung or Pneumonia problems should consult a doctor before even thinking about a visit. Day 01 KATHMANDU-NYALAM (3600 M)-154 km. 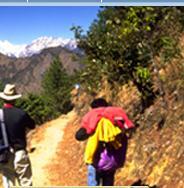 Departure at 5:30 am from Adventure Nepal Experienced Adventure Treks (P.) Ltd. Thamel after an approx. 5 hours drive we reach KODARI (China/Nepal Boarder). Further half hr. drive by jeep/truck will bring us to Zhangmu, where after completion of Immigration formalities all check drive to Nyalam (2 hrs). Over night in guest houe. From Nyalam, the road follows starting of BHOTE KOSHI, after 1 hr. drive you will be able to view Milarepa cave. drive bring us to NYALAM PASS (5320 m) with the JUGAL HIMAL in view. A continued drive via LALUNGLA (5050M) will bring us in view or MT. LANGTANG (7245m), MT. XIXAPANGMA (8013m), MT. DORJE LAKPA 6980m), MT. MAKALU(8464m), MT. EVEREST (8848m), MT. LHOTSE 8516m), & MT. CHO YU (8201m). Over night in guest house. Day 03 LHATSE-XIGATSE( 3900m) -210 kms. Lhatze is 6/7 hr. away over a 5220 m pass Near the petrol station, there is a small restaurant where tea/snacks are available reach XIGATSE, the place of the famous TASHILUMPO MONASTERY the seat of Panchen Lama until his death in 1989 with its huge Thanka wall clearly visible on north side of the road. Over night in guest. After visiting TASHILUNPO MONASTRY in the morning including the Bazaar of XIGATSE, drive to GYANTSE which is 03 hr. Gyantse is small bustling town steeped in history. It lies 264 km South West of Lhasa on the northern back of NYANG CHU river. In the 15th century it served as the capital of small kingdom. Visit KUMBUM CHORTEN & PHKLKOR MONASTERY which was built around 1400 AD it later become the main centre for trade with British India. Over night in guest. 08 hr. drive takes you to Lhasa crossing the KAROLA PASS (5010m) and KAMABALA PASS (4795m). The KAROLA climbs between two lofty mountains, NOZING KHANGSA (7223m) and RALUNG (6236m) while driving you will see the YAMDROK TSO (Turquoise lake) which takes approx. 1 hour to cross around. After passing KAMBALA, Lhasa valley is seen to the north. You will also cross the Brahmaputra River. Reaching Lhasa and check in hotel. The accompanied guide will reconfirm you onward airline ticket. Over night in guest house. These days you will be engrossed with sight seeing and excursions of THE POTOLA PALACE, THE JOKHANG TEMPLE surrounding BARKHOR market DREPUNG MONASTERY and SERAMONSTERY. Over night in guest. Transfer to airport 2 hr. our representative will assist you. Departure of flight for KATHMANDU would be approx. 10:00 hr CHINA STANDARD TIME and arriving KATHMANDU at 09 hr. NEPAL STANDARD TIME, flight Lhasa ? Kathmandu takes 01 hour ten minutes. During the flight you will see the following: YARLUNG TSANGPO RIVER, LAKE YAMDROK, MT. KANCHENJUNGA (8586 m) Mt. Everest (8848 mtrs.) and many more snow caped peaks. Tibet has only a handful of towns and Tibetan cuisine is not exactly the most varied in the world. It is a handy to carry. Anything that can be brewed 2 with hot, water instant coffee, drinking chocolate, tea (bags) soup cubes, vegemite nuts and raisins, chocolate, dry foods and biscuits. The people’s money used by millions of Chinese everyday, circulates in notes a of 1,2,5, 10 and 50, 100 Yuan, 1,2 Jiao, 1,2 and 5 fen. There are also coins for 1, and 5 fen. With the Chinese Currency Renminbi, one Yuan is divided into 10 jiao, into 10 fen. (app US$ 1 =10 yuan). Traveling in Tibet involves high altitude and can be strenuous. Clients with heart and lung problems or blood diseases should consult their doctor before booking the trip. Very rare cases of altitude sickness have been reported. Simple headache, fever, loss of appetite and stomach disorders can happen before the acclimatization. Advised, drink approx. 04 liters. Of water per day, do no strain yourself, move slowly, breathe deeply and take regular rests please do not smoke & do not drink alcohol. Our most competitive cost for your kind acceptance US$ 750 per person. All transfer by tourist bus to border, jeep, border -Lhasa, flight Lhasa-Kathmandu, sightseeing in route and Lhasa, lodge accommodation along the way in two in sharing basis with breakfast. Monastery entrance fees, one English speaking guide for all tour, budget hotel in Lhasa, Tibet travel permit, group visa etc. Meals, personal expenses, airport tax, insurance, emergency visa fees, tips, extra portering charges incase of land slide on the way porter fee etc. To get split visa each client has to pay US$ 25 per person.